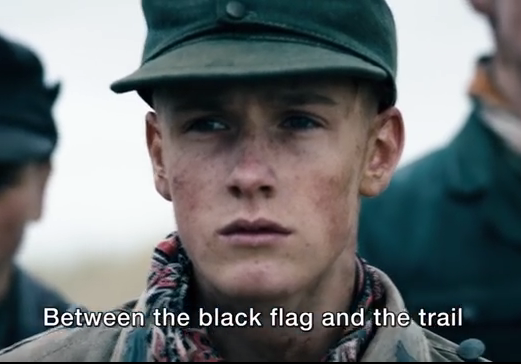 And then he tightens it some more: these prisoners are barely more than children — the painfully young recruits heaved up during the Third Reich’s death spasms. They strive mightily to carry out their nightmarish task with a soldier’s resolve and efficiency. They seek a balance between stoic acceptance of their fate and subtle attempts to improve their lot. And they bolster each other’s spirits with talk of what they’ll do when the job’s done and they’re sent home. But their youth is inescapable, and even Rasmussen can’t help noticing that when they’re hurt, they call out for Mom. Still, he’s got a schedule, and a ravaged country to boot. So he manages to remain adamantine in the face of the boys’ suffering and starvation, even after they become violently ill from eating stolen grain that turns out to be full of rat feces. It isn’t until he sees the ugly joy of the farmwife whose grain it was (“I got some Germans, after all”) that he begins to sense the shadow on his soul — and the souls of his fellow soldiers. But even if Rasmussen changes, the work doesn’t. The strain is terrible, and even respites are haunted by the explosive remnants of a war that has ended but isn’t anywhere close to being over. And of course, a softened heart is a vulnerable heart. 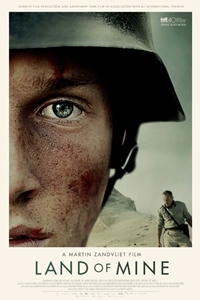 The saying “no good deed goes unpunished” may ring truer in wartime than in any other; Land of Mine knows it has to go looking elsewhere for the cause of human kindness.